Fans of James Patterson, John Grisham, Janet Evanovich, and Michael Connelly will love this legal suspense thriller by Aaron Patterson. "I would recommend this book to anyone who likes James Patterson or books like his. I can't wait for the next book to come out." "...I think if Tom Clancy crossed genres it would look something like this. Well done." Sarah Steele needs a vacation from her high-profile job as an ADA, so she goes with her best friend on a trip they've always dreamed of to Rio De Janeiro. The vacation is off to a great start; surfing, swimming, reading, and dancing, but then their little piece of heaven takes a hellish turn. Sarah witnesses The Blondes, a mysterious group of female criminals who specialize in micro-kidnapping, capture a State Representative's wife. It was supposed to be simple, the police say the victims are always released within a few hours. But when the woman's found dead in a dumpster, Sarah swears The Blondes will receive justice. And she'll be the one to give it. But as things get more twisted than she ever imagined, does she have what it takes to bring them down? 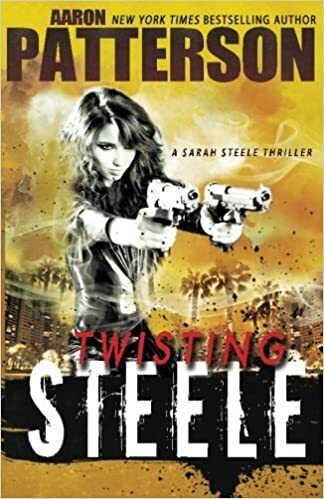 TWISTING STEELE is for Kindle readers who enjoy Alex Cross and James Patterson's Michael Bennett novels rave about Aaron Patterson's Mark Appleton. For people who enjoy mystery thriller & suspense international mystery & crime, mystery thriller & suspense thrillers pulp, mystery thriller & suspense private investigators women sleuths women detectives, crime fiction, organized crime kidnapping, action-packed, vengeful, female protagonists, urban, international crime.